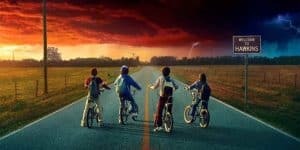 Stranger Things Season 2 Coming October 27 | Nerd Much? It seems that despite the folks over at Netflix implying that Stranger Things season 2 will be arriving on Halloween, we now have the official date just before the main event of October. Season 2 will be coming October 27, so you’ve got plenty of time to start watching the show before you go out to collect or buy your candy. But there’s only nine episodes, so be sure to take your time. Netflix also showed off a teaser trailer on their official Twitter account, which shows absolutely nothing more than the poster does. 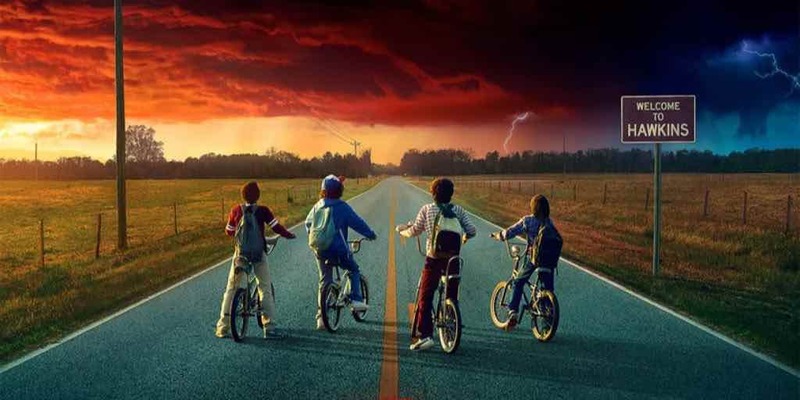 Red skies are ahead, and all four of the pre-teen main characters are riding their bikes straight towards it. What could the team be investigating this time? According to the description of season 2, it takes place a year after season 1 in 1984. That tell tale year. Apparently the Hawkins townsfolk are still trying to handle what happened in the first season. Can’t just walk off a demagorgon, unfortunately. Despite Will Byers being rescued from the Upside Down, there is still a bigger and more sinister threat on the horizon. If you haven’t watched the first season of Stranger Things and you enjoy old horror movies, do so as soon as possible. The show centers around the various mysterious forces that often escape the secret government lab somewhere in the town. Critics like the show so much that they’re sure it’s going to be nominated for an Emmy Award this week. Stranger Things is created by brothers Matt and Ross Duffe. Both are known for their work on Hidden, We All Fall Down, and Eater. All of which are critically acclaimed horror flicks. If that bucket of talent wasn’t enough, Stranger Things also stars Millie Bobby Brown, Winona Ryder, David Harbour, Finn Wolfhard, Caleb McLaughlin, Gaten Matarazzo, Noah Schnapp, and Charlie Heaton. Most of these actors have made their debut on the show, and are certainly going places from here.